Try as I might, I’ve never managed to make a decent corn bread. It’s dry every time. I know what you’re thinking. Corn bread is supposed to be dry. Better for dipping in gravy or chili. Sometimes, though, I want to eat the corn bread, just because–without smearing it with butter or chili (and does anyone eat gravy, anyway?). So just in time for Thanksgiving, I’ve made a breakthrough. I think the key here is the almond flour (available at Trader Joes, in the nut section) and apple sauce. But, if you don’t want to seek out almond flour, and your corn bread does come out dry, fear not. Leave it out on the counter for a day or two and whip up some corn bread stuffing. Yum. Preheat the oven to 400. Mix all the dry ingredients in a bowl. Mix the oil, milk, apple sauce and egg in another bowl. Slowly add the wet ingredients to the dry ingredients and mix until just combined. Bake in a greased 8×8 pan for 25-30 minutes or until a toothpick comes out dry. Preheat oven to 400. Soak the bread and cornbread in water for a second and drain. Stir in the egg, oil, salt and pepper. Set aside. Saute the onion in oil over medium heat until lightly browned. 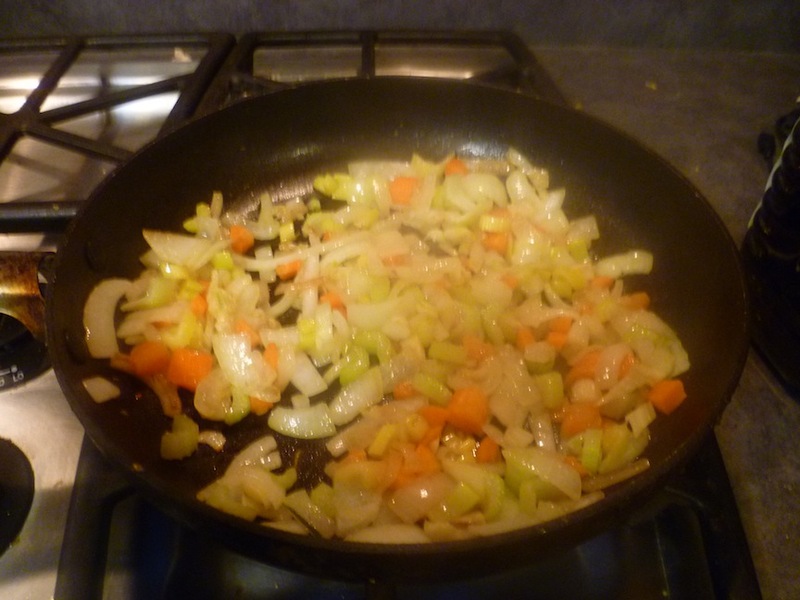 Add the garlic and other vegetables and saute until soft. Mix vegetables into the bread mixture. 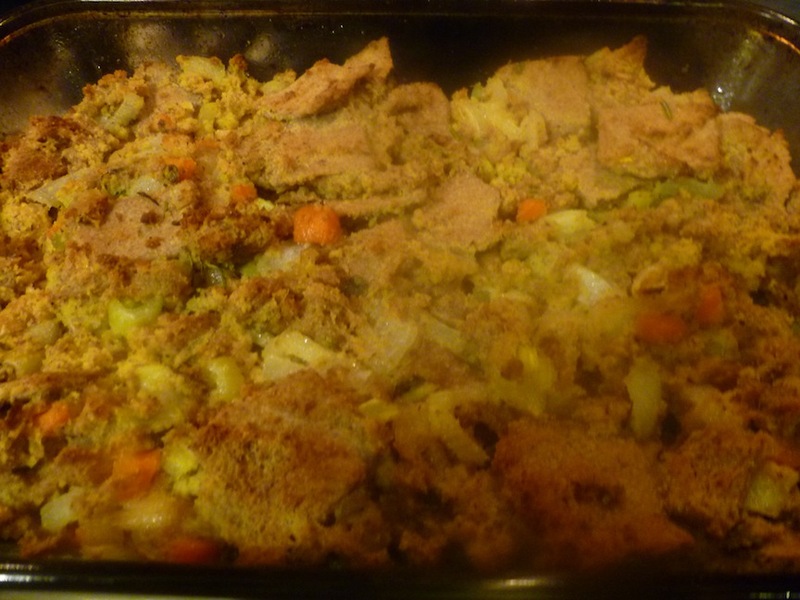 Pour mixture into a baking pan and bake for 30 minutes or until stuffing reaches desired crispiness. I love cornbread, but not in stuffing for some reason. But I DO like the looks of your low-fat yet moist cornbread recipe. Never thought to add almond flour … will have to definitely try a batch. Thanks for sharing! 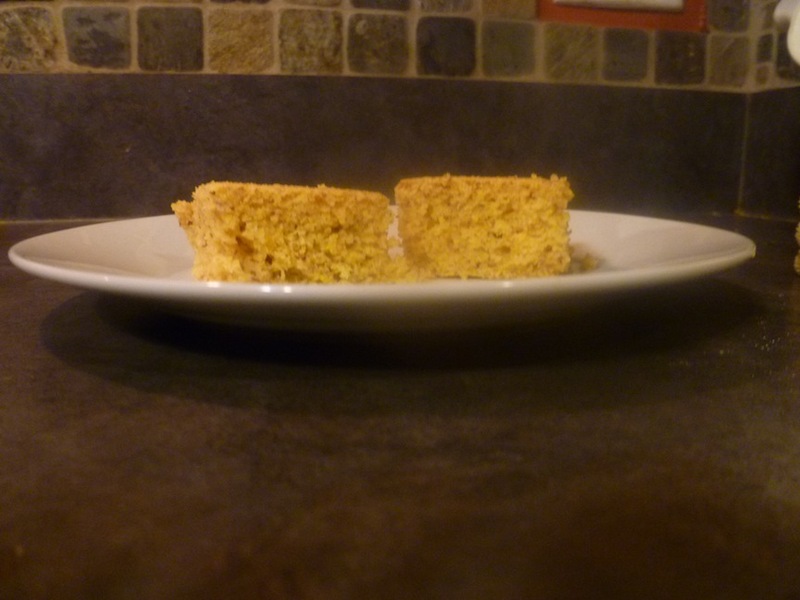 It’s hard to find a really moist cornbread recipe that is pareve. I’m glad this one is! My corn bread isn’t the best I have ever eaten, but it’s moist. It’s also a gluten free dish. I feel like dry corn bread would be unpleasant.